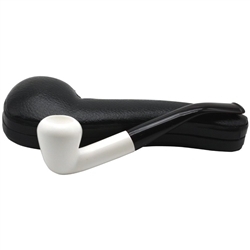 Hand Carved Smooth Dublin Style Meerschaum Pipe - Smooth finished Dublin style pipe bowl has a rounded top with a shank that is longer than usual. The black bent stem is a bold and distinctive contrast to the white meerschaum. This definitely is an eye-catching pipe.